A heating oil delivery truck advertises a price of $2.72 per gallon while making deliveries in Thursday, Oct. 11, 2018, in South Portland, Maine. As of Jan. 7, the price of heating oil had fallen 9 cents over the past three weeks. Oil, propane and kerosene prices for heating homes and businesses were down across the board this week compared to last week, extending a three-week downtrend in prices, the Governor’s Energy Office said Wednesday in its weekly heating fuel price survey. On Jan. 7, the average cash price for No. 2 heating oil was $2.86 per gallon, down 9 cents per gallon since three weeks ago and down 2 cents since last week. The average statewide kerosene price also dropped 9 cents and stands at $3.45 per gallon. The average propane price dipped to $2.87 per gallon, just below the $2.88 or $2.89 per gallon statewide price that has held steady since late October. 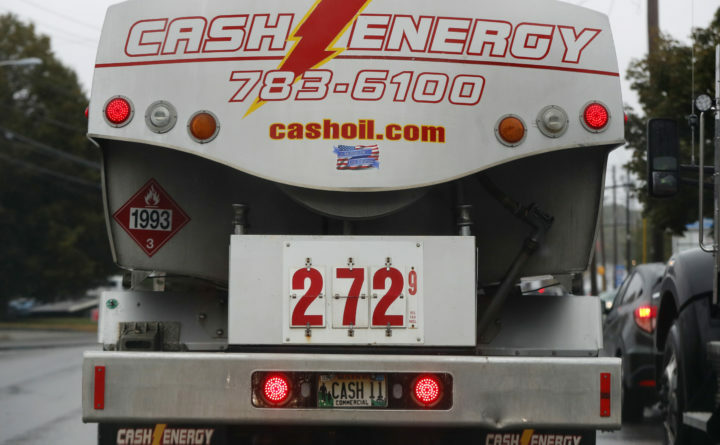 The price for heating oil was the lowest in southwestern Maine at $2.49 per gallon on Jan. 7. The price for kerosene was the lowest in northern Maine at $3.37 per gallon, and propane was lowest as well in that region at $2.66 per gallon. Crude oil prices dropped almost 40 percent from early October into December, and have since ticked up slightly, according to the governor’s office. Prices are now approximately 30 percent lower than early October highs of $52 per barrel for the benchmark West Texas Intermediate oil to $61 per barrel for the benchmark Brent oil. Despite the recent increases in crude prices, heating oil prices have continued a slow decline during the past few weeks. Crude oil prices are a significant factor contributing to the final price of heating oil, but weather also plays a large role, the governor’s office said.